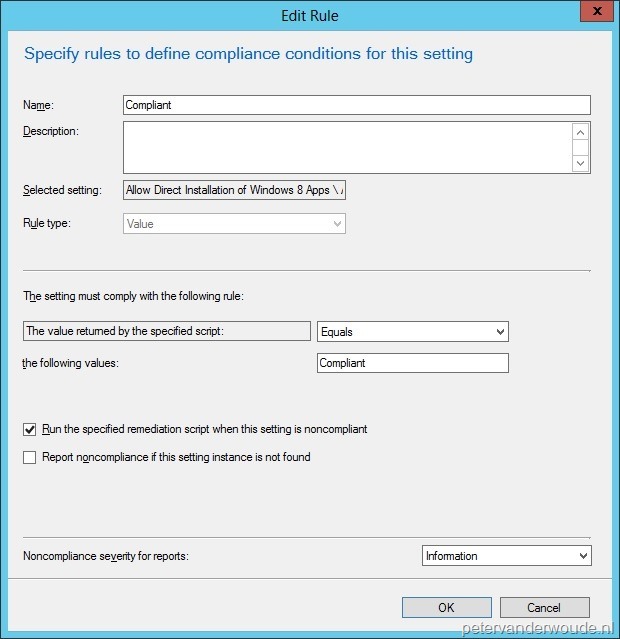 This weeks’ post will be about Going to the desktop, instead of Start, when signing on Windows 8.1 via Compliance Settings. I will write about the scripts for discovering and remediating this setting, either on a user based, or a computer based configuration, via a Configuration Item. Keep in mind that it won’t be a walkthrough. 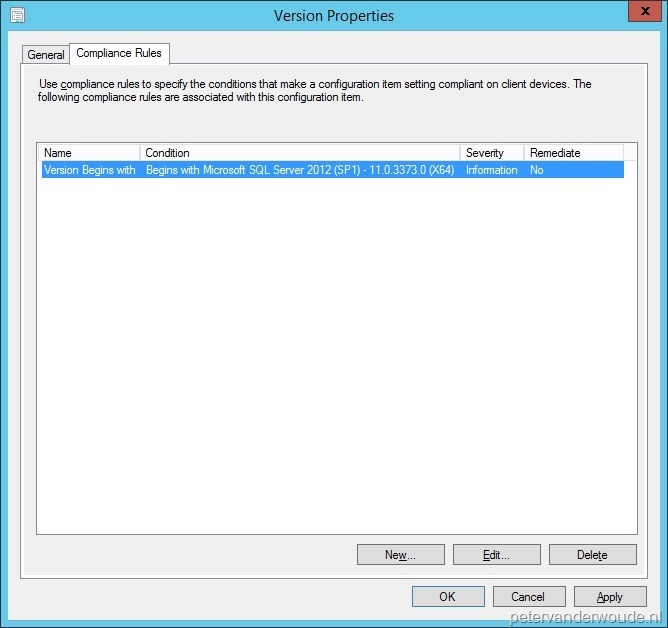 For a complete step-by-step example, about using scripts in Compliance Settings, take a look at my post about Allowing Direct Installation of Windows 8 Apps via Compliance Settings in ConfigMgr 2012. 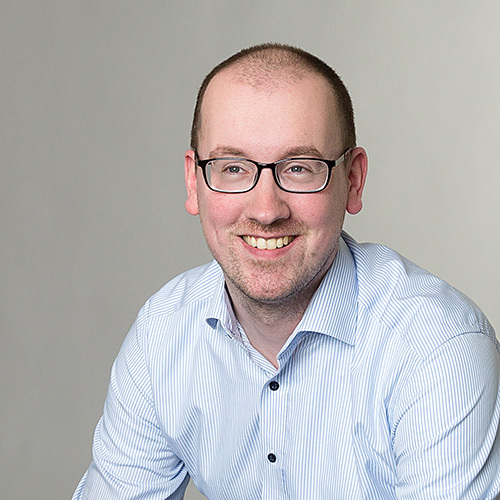 Of course, in the most situations, the preferable way for configuring this settings is via a Group Policy (as described in this great post of Sander Berkouwer). 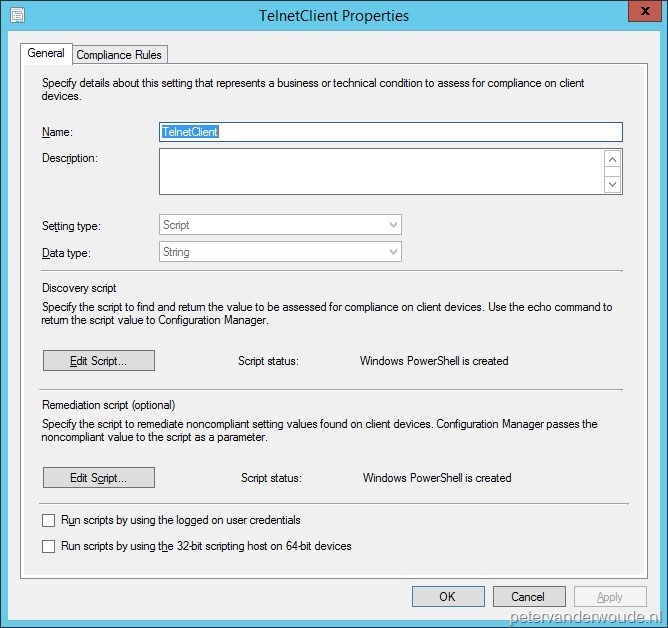 There are a only a few reason not to use a Group Policy, and to start looking at Compliance Settings, like when the device is not a member of the domain, or when the company likes one way to configure a setting for all devices. Now lets start with the first scenario. In this case we want to configure it for every user that logs in to a device. The best way to configure this is via HKEY_LOCAL_MACHINE. For this we need to create a discovery and remediation script for the existence and value of the value GoToDesktopOnSignIn in the key HKEY_LOCAL_MACHINE\SOFTWARE\Policies\Microsoft\Windows\Explorer. The discovery script has only one purpose and that’s to find find the mentioned registry key and its value. When the script finds the registry key, it will return Compliant, otherwise it will return NonCompliant. 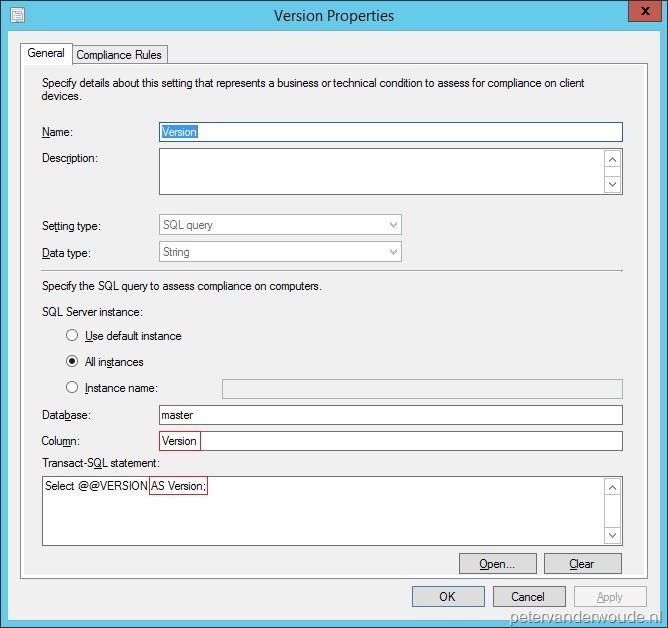 The Compliance Rule of the Configuration Item should check on the returned value of Compliant. Also the remediation script has only one purpose and that’s to find find the remediate registry key and its value. This script will create registry key and when needed also the path to the registry key. 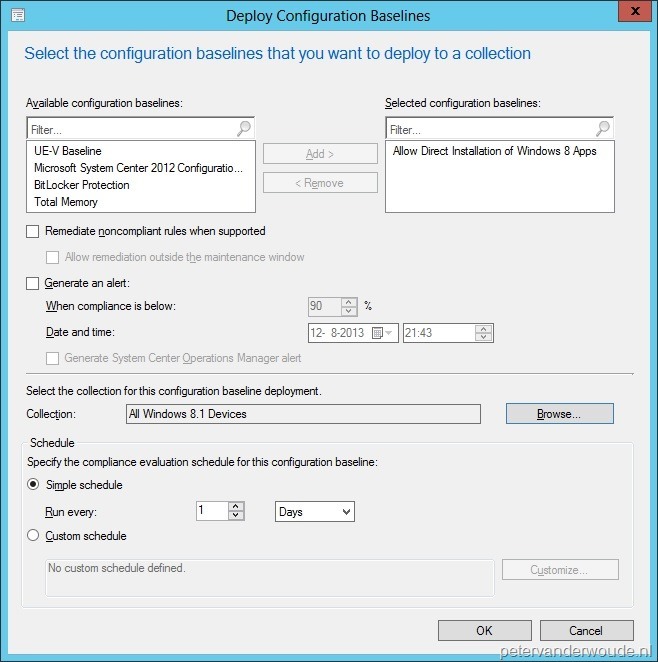 By default, ConfigMgr will run the discovery and remediation scripts with the SYSTEM account. In this situation this means that actions written to HKEY_CURRENT_USER will actually be written to HKEY_USERS\.DEFAULT. Running the discovery and remediation scripts by using the logged on user credentials will end-up in an Access Denied message. As a normal user can’t write in the policy registry keys under HKEY_CURRENT_USER. Note: This is a good option when the targeted users are administrators on their devices. So we need to get creative. The registry keys that we CAN edit, per user, with the SYSTEM account, are under HKEY_USERS. This means that the way to workaround this, is to use the value GoToDesktopOnSignIn in the key HKEY_USERS\<CurrentUserSID>\SOFTWARE\Policies\Microsoft\Windows\Explorer. The discovery script has only one purpose and that’s to find find the mentioned registry key and its value.The first thing this script does is determining the current logged on user and the corresponding SID. That information will be used with searching the registry key under the HKEY_USERS. When the script finds the registry key, it will return Compliant, otherwise it will return NonCompliant. 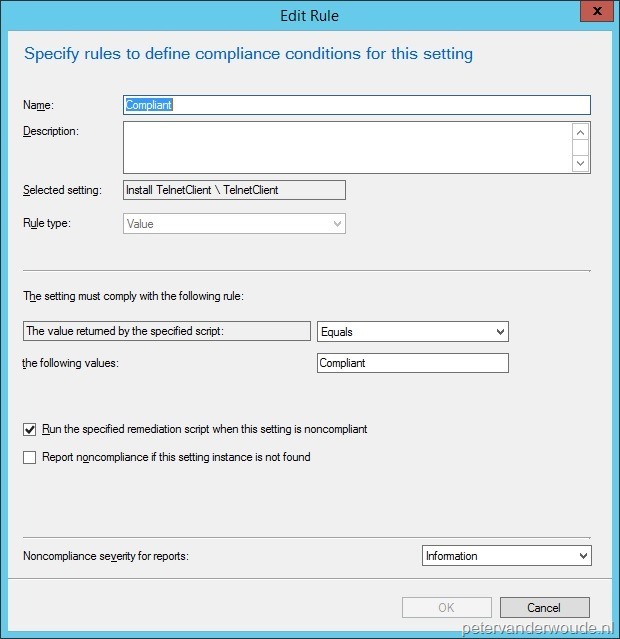 The Compliance Rule of the Configuration Item should check on the returned value of Compliant. Also the remediation script has only one purpose and that’s to find find the remediate registry key and its value. Like the discovery script, the first thing this script does is determining the current logged on user and the corresponding SID. That information will be used with creating the registry key, and when needed also the path to the registry key, under the HKEY_USERS. 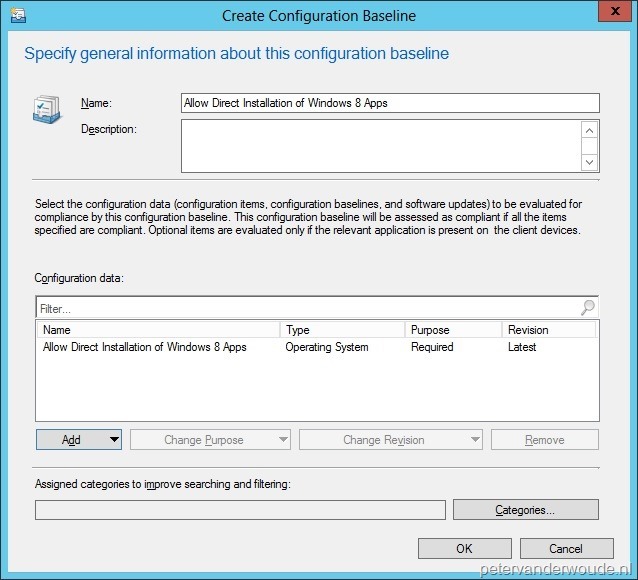 It is very doable to use a Configuration Item to configure Going to the desktop, instead of Start, when signing on Windows 8.1, in either a user based, or a computer based configuration. 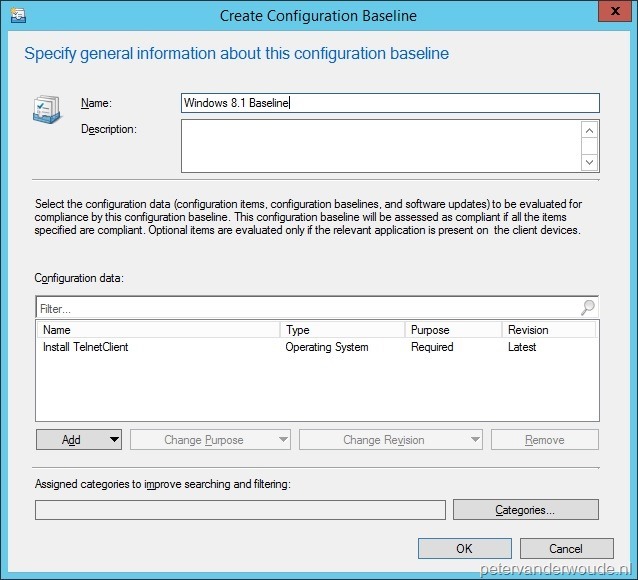 The user based configuration needed some creative scripting, but the computer based configuration is very straight forward. 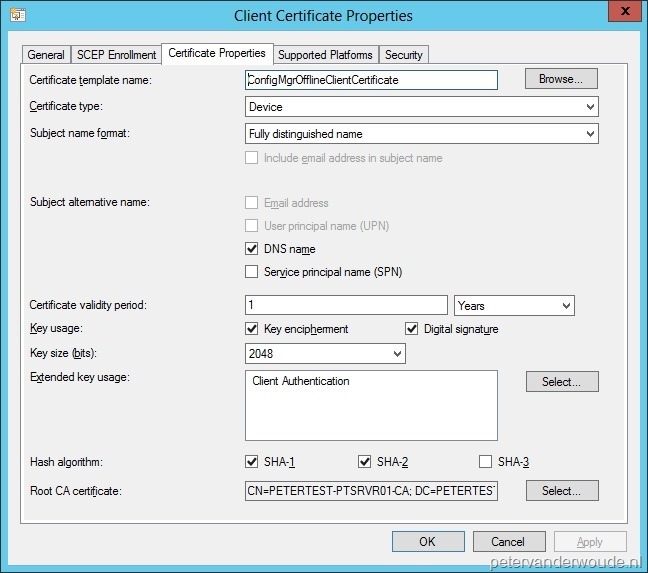 This week I want to devote a post to something new in ConfigMgr 2012 R2, which is still in a preview state, called Certificate Profiles. These profiles integrate directly with Active Directory Certificate Services (ADCS), and the Network Device Enrollment Service (NDES) role, to provision managed devices with authentication certificates. 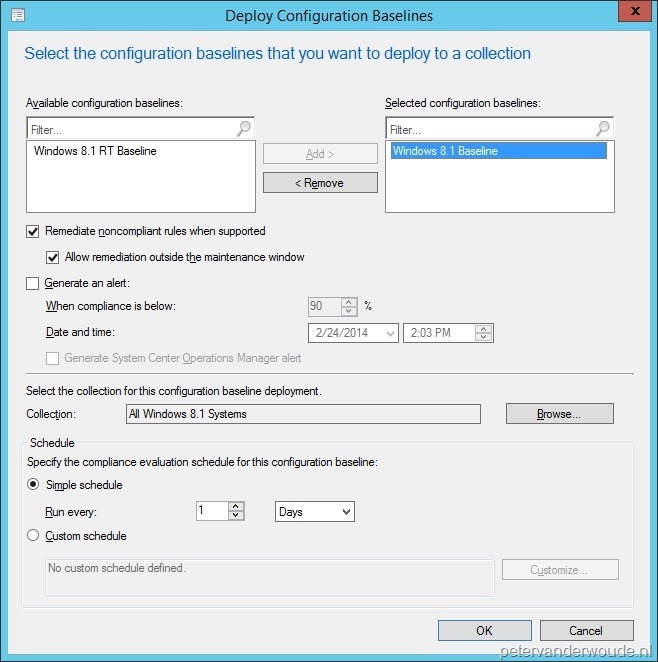 This means that another Group Policy setting is coming to ConfigMgr AND, maybe even bigger, this creates a possibility to automatically deploy certificates to non-domain devices. Note: The Certificate Registration Point doesn’t have to be installed on the NDES server. 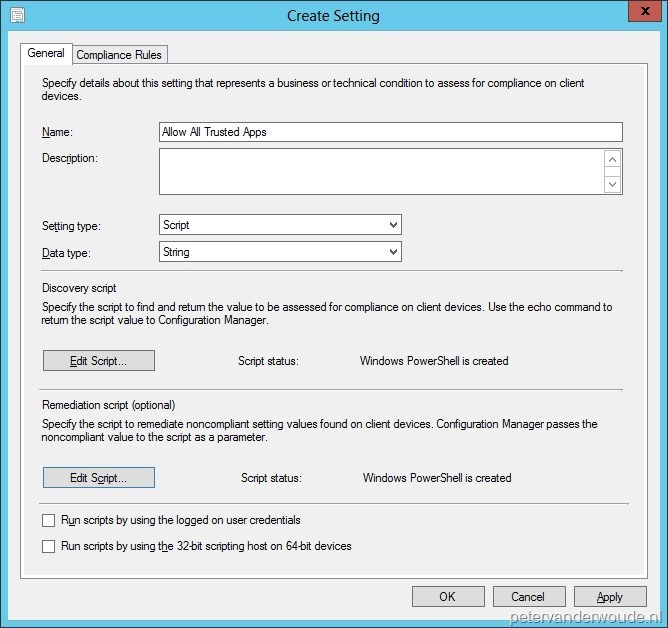 In the Configuration Manager Console navigate to Assets and Compliance > Overview > Compliance Settings > Company Resource Access > Certificate Profiles. On the Home tab, in the Create group, click Create Certificate Profile and the Create Certificate Profile Wizard will popup. On the General page, fill in with Name <aCPName>, select Trusted CA certificate and click Next. 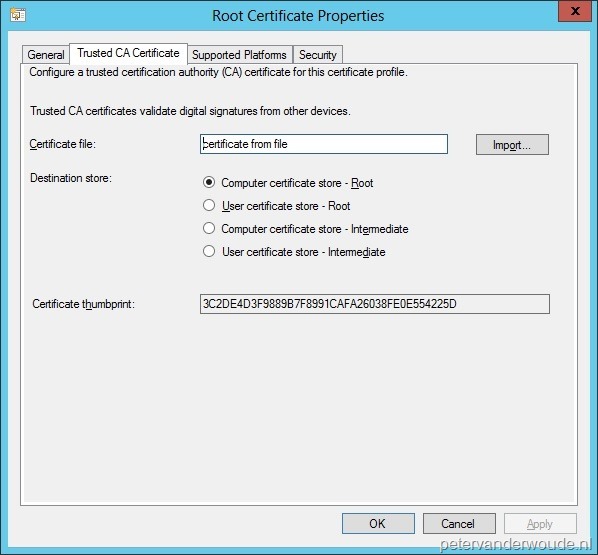 On the Trusted CA Certificate page, browse (by clicking on Import) to the exported root certificate, select Computer certificate store – Root and click Next. On the Supported Platforms page, select Windows 8.1 Preview and click Next. Note: All the other supported platforms are iPhone/ iPod/ iPad 5 and 6 and all Android devices. Select the new item <aCPName> and on the Home tab, in the Deployment group, click Deploy and the Deploy Trusted CA Certificate Profile popup will show. 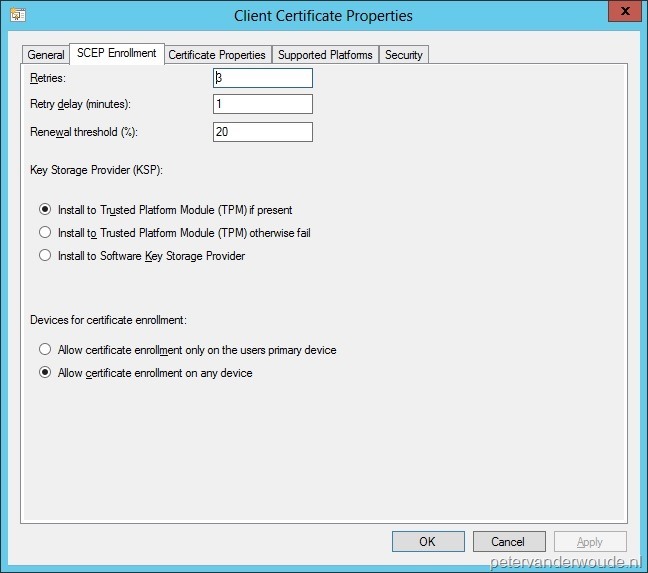 On the Deploy Trusted CA Certificate Profile popup, browse to a device collection, select Remediate noncompliant rules when supported and click Ok.
On the General page, fill in with Name <aCPName>, select Simple Certificate Enrollment Protocol (SCEP) settings and click Next. On the SCEP Enrollment page, select Install to Trusted Platform (TPM) if present, then select Allow certificate enrollment on any device and click Next. On the Certificate Properties page select with Certificate template name <aCertificateTemplate>, select with Root CA certificate the previously created Certificate Profile and click Next. Note: All the other settings will be filled automatically, but are customizable, based on the selected template, but Read rights on the selected template are necessary for the user. Also the selected template has to be configured on the Network Device Enrollment Service server, in the following key: HKEY_LOCAL_MACHINE\SOFTWARE\Microsoft\Cryptography\MSCEP.